2010 Sun Tracker PARTY BARGE 20 Classic Series This 2010 Sun Tracker Party Barge 20 comes with a 2006 Mercury 50hp 4-stroke. 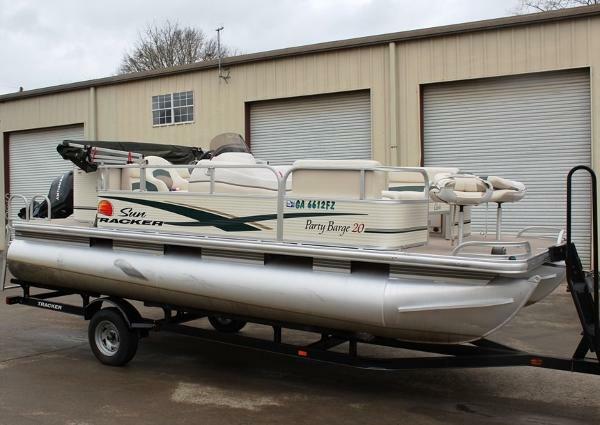 When you're looking for a way to create more special time with your family, the SUN TRACKER PARTY BARGE 20 Classic Series is a family pontoon boat that's worth its weight in gold. Kids, grandparents, everybody gets a charge out of being together out on the water. On the PARTY BARGE 20, there's ample room and time for EVERYBODY's favorite pastime: to relax and do nothing more'or to swim, jump, float, tube, eat, play board games, experience nature, picnic on the shore. You name it! 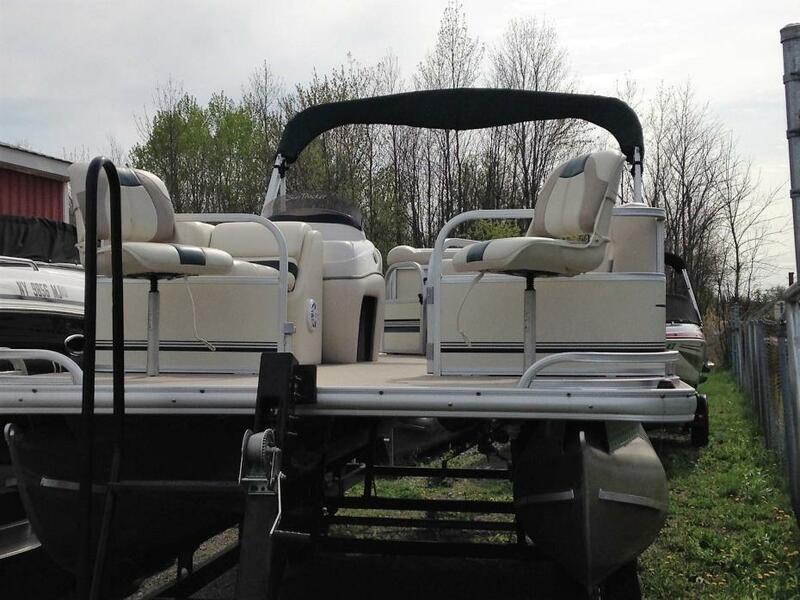 For seasoned anglers, or those just learning, we've even included two comfy fishing seats up front. So what are you waiting for? This is the easiest-to-handle, easiest-to-own pontoon in the PARTY BARGE line. And it's ready to host your crew of ten. Let the fun begin! Features: 24" (60.96 cm) multichambered pontoon tubes Extended all-welded aluminum motor pod for more usable deck space Color-keyed 7' (2.13 m) Bimini top Captain's plush & supportive bucket seat Fiberglass-reinforced console w/tinted windscreen, easy-to-read gauges & storage Sirius-capable AM/FM/CD stereo w/MP3 jack & 2 speakers 2 bow folding fishing chairs 2 bow couches w/closed underseat storage Aft L-lounge w/closed underseat storage & small-item armrest storage Aft padded sun deck Full-width aft swim platform w/fold-down boarding ladder. Also trolling motor not shown in pictures. Includes single axle drive-on trailer with steps.